Monday, August 13, 2018, is the first day of school for Pre-K – 12th grade. Students who attended school in the Russellville School District last year are pre-registered. All students attending Russellville schools in kindergarten through fourth grade who are new to the district should register as soon as possible beginning Monday, July 23rd. Elementary students should register at the school in their zone. Please bring your child’s birth certificate, Social Security card, immunization record, and Medicaid card (if applicable). Kindergarten students must present a recent physical examination record. Office hours for all elementary schools are 8 – 3:30 p.m. Monday through Friday. Center Valley Elementary is located at 5401 SR 124, and the telephone number is 968-4540; Crawford- 1116 North Parker Road, 968-4677; Dwight - 1300 West Second Place, 968-3967; London - 154 School Street, 293-4241; Oakland Heights - 1501 South Detroit, 968-2084; and Sequoyah - 1601 West 12th Street, 968-2134. Elementary students who will attend the same school as last year are already pre-registered. Elementary students who have moved within the Russellville School District and will be attending a different elementary school should contact the school attended last year as well as the school they will be attending. Classroom assignments for elementary students in kindergarten through fourth grade will be posted on front doors of the elementary buildings at 1 p.m. on Thursday, August 9th. Supply lists can be found on the website under documents. Copies of supply lists are also available at area stores. Each K-4 school will also be hosting a grade level Parent Night at the beginning of the school year. Important information will be shared during those meetings. Be sure to watch for details. Upper Elementary 5th Grade (UE5G) is located at 1201 West Fourth Place. The school occupies the east wing of the Middle Grades Complex. The telephone number is 968-2650. All students in fifth grade who are new to the Russellville School District should register as soon as possible beginning Wednesday, August 1st. Please bring your child’s birth certificate, Social Security card, immunization record, and Medicaid card (if applicable). Office hours are 8 - noon and 1- 4 p.m. Monday through Friday. All fifth-grade students will receive classroom assignments and meet their teachers between 4 - 6 p.m. on Thursday, August 9th. If you arrive prior to 4 p.m., you may wait in the cafeteria. This is a “come and go” event. Room assignments will be given out 4 p.m. and you can proceed to the classroom at that time. Students and parents/guardians are encouraged to attend to receive this necessary information concerning teacher assignments. Students may choose to bring school supplies at this time, so they can have them ready for the first day of school. Personnel from the cafeteria and transportation departments will be available to answer any questions parents may have regarding breakfast, lunch, and bus issues. The Russellville Middle School is located at 1203 West Fourth Place (west wing of the Middle Grades Complex). The telephone number is 968-2557. All students new to the district should register as soon as possible beginning Monday, July 30th. Office hours are 8 - noon and 1 - 4 p.m. Monday through Friday. 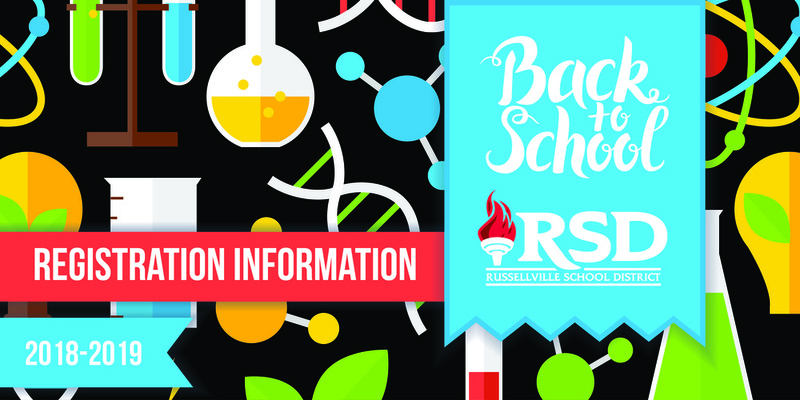 Students who attended Russellville School District last year are pre-registered and may pick-up their schedules on Thursday, August 2nd, 4 - 7 p.m. and Friday, August 3rd, from 9 - 3 p.m. in the RMS Cafeteria. The office will be open during the noon hour. Parents should accompany their child to ensure paperwork is accurate and complete. Locker assignments will be given when students receive schedules. The cafeteria manager will also be available on these dates as a convenience to parents and guardians who may wish to deposit money into their child’s meal account prior to the first day of school. Russellville Junior High School is located at 2000 West Parkway. The telephone number is 968-1599. All students new to the district should register beginning Monday, July 30th. Office hours are 8 - 3 p.m. Monday through Friday. Students who attended Russellville School District last year are pre-registered and may pick-up schedules on Thursday, August 2nd, from 8 – 3:30 and 5:30 – 7:30 p.m., and Friday, August 3rd, from 8 – 3:30 p.m. Parents should accompany their child to ensure all paperwork is complete. Russellville High School is located at 2203 South Knoxville. The telephone number is 968-3151. Students new to the district should register as soon as possible beginning Monday, July 30th. Office hours are 8 - 3 p.m. Monday through Friday. *Before students will be allowed to pick up their computers, they must bring a Russellville High School Student Laptop Program Acceptable Use Agreement Form and an Internet Use Agreement Form signed by the student and the parent. The User Agreement Form and Internet Use Agreement Form can be found on the Russellville School District and Russellville High School websites at www.russellvilleschools.net/documents, or can be picked up in the RHS front office. Russellville School District (RSD) is currently accepting applications for the Preschool Program for the 2018-2019 school year. To be eligible, students must be 3 or 4 years old by August 1, 2018. Openings are available at all levels, including a no cost level (Eligibility per program qualifications), a sliding fee scale level, and full fee level. Classes are available on several RSD elementary school campuses and follow the school schedule. You can obtain a preschool application at the old Gardner Building at 1000 South Arkansas Ave., in Russellville, or on the RSD website, www.russellvilleschools.net/documents. For more information about the preschool application process, contact Jenny Barber, Supervisor of Federal Programs and Pre-School Education at 967-6025, jenny.barber@russellvilleschools.net.